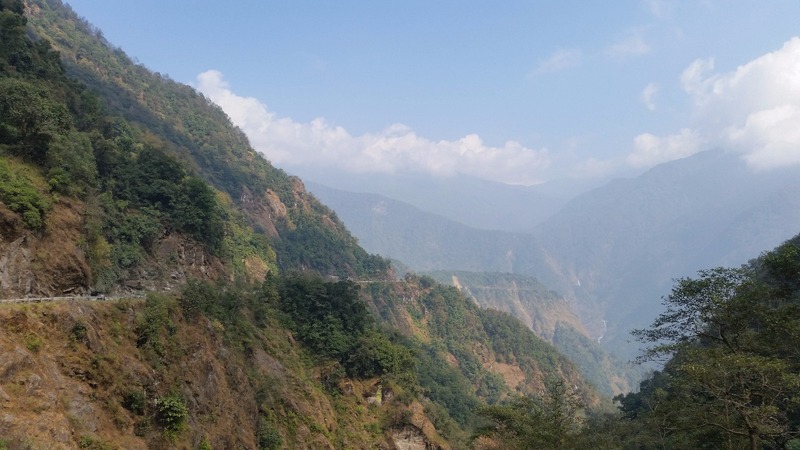 The immigration checkpost is about six kilometres north of Phuentsholing. 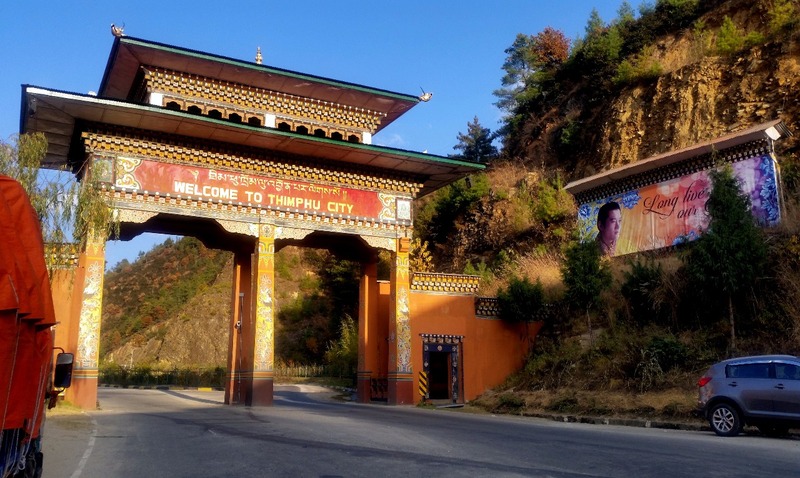 This is the last point in Bhutan you can travel without a permit. 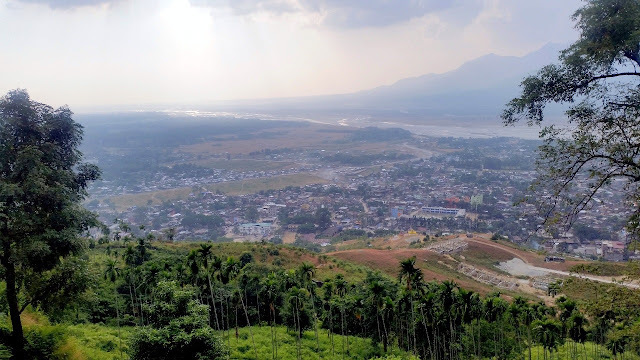 About a kilometre before, there is a monastery known as Kharbandi Gompa from where you can get a grand view of the city, adjoining Jaigaon and the Torsha river. We chose to visit this place on our way back, but the same can be done en-route Thimpu also. 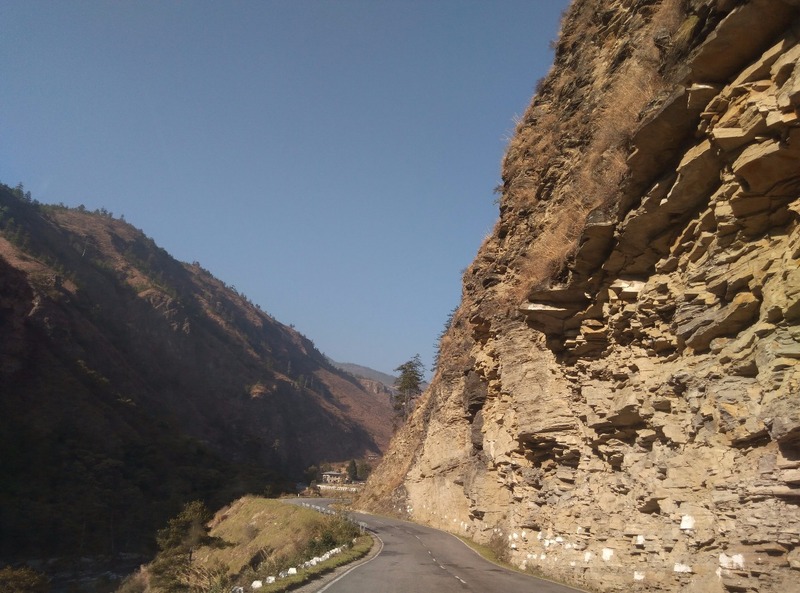 After you cross the checkpost, the road winds up into the mountains and you have some of the best views of the entire trip. For travellers to Bhutan, there is an option to directly fly to Paro, but it is discouraged by travel experts as the journey from Phuentsholing to Thimpu or Paro with hundreds of hairpin bends is scenic and scintillating. After an hour or so, we reach Gedu halt. 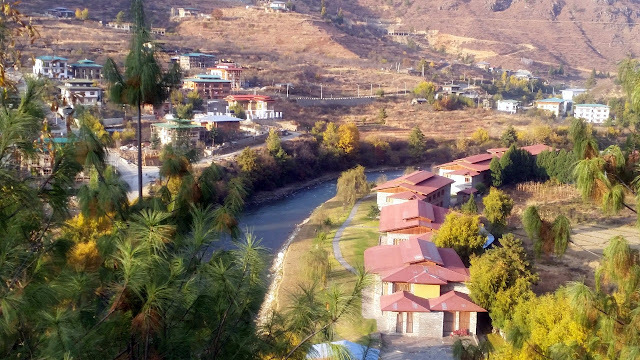 The small town is dotted with restaurants to provide refreshment to travellers en route Thimpu. Our driver suggests a place called Lhamu Restaurant & Bar just before the town. In rural Bhutan, most of the small restaurants double up as a bar, and sometimes even as a mini grocery shop. 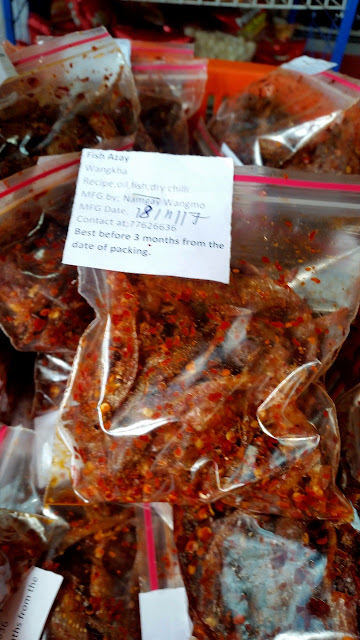 We found some Ezey sold in sachets apart from the usual stuff at the Lhamu shop. 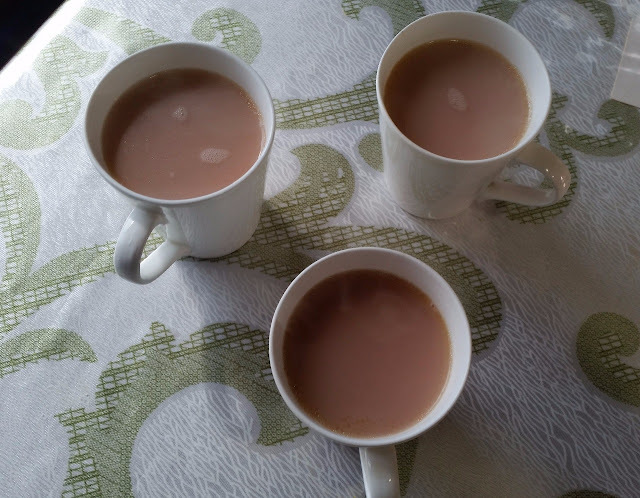 It is at Gedu that we try out our first Suja, the Bhutanese butter tea. 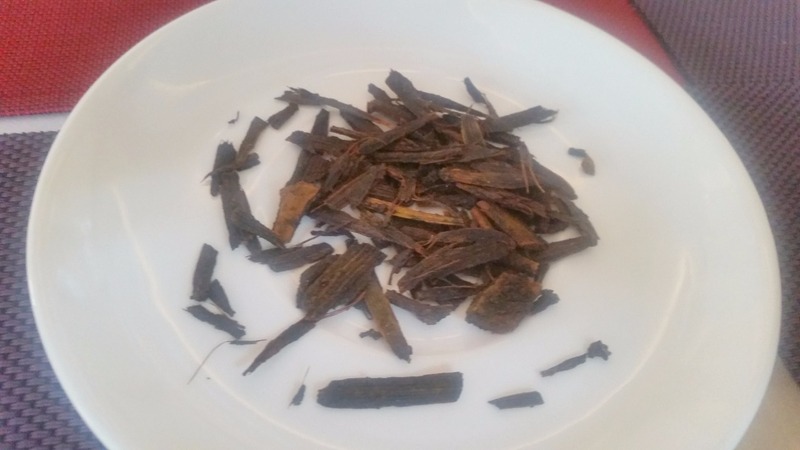 Made with a lot of butter and a little salt (and no sugar), this tea is refreshing and like kahwa in Kashmir provides warmth in the cold climate. The black tea leaves used to make Suja is of a different variety, and we are shown a sample of the same. 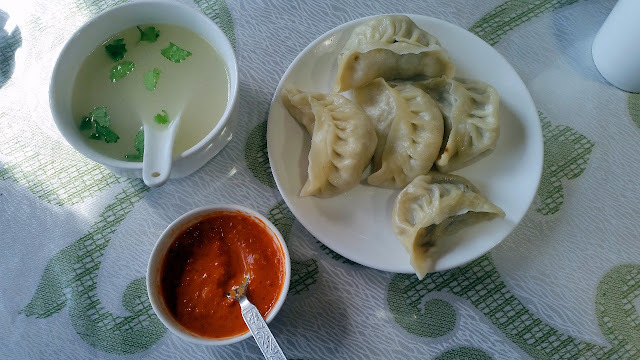 The restaurant also serves Bhutanese food, but as it was only around 11 am, we fall for some freshly prepared Beef Momo. A small joint next to the place sells Bhutanese Paan which my wife became a fan of. She bought some on the return journey too. After Gedu, the scenery became even more mesmerizing. The mountains were still green with vegetation, and the windy roads had some breathtaking hairpin bends. 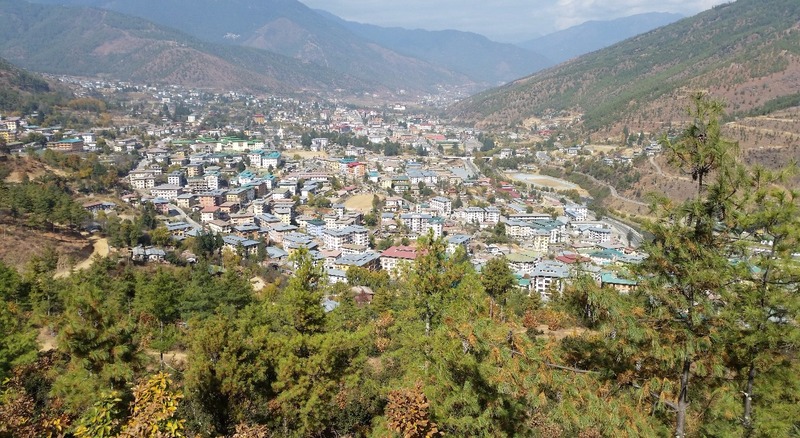 Thimpu is about 2300 metres above sea level, so the climb is fast. 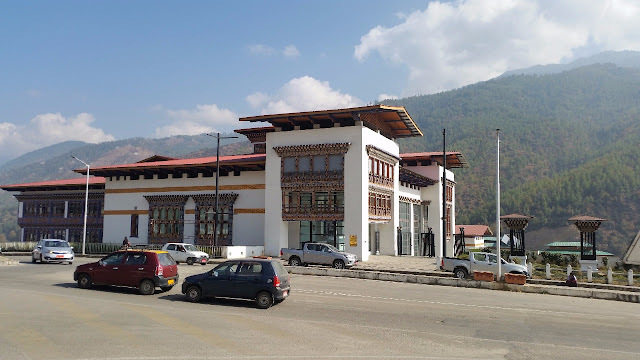 We pass by a huge building which is one of the main offices of Bhutan Telecom. A waterfall comes next, and soon we reach the second halt during our journey, a bigger town named Chukha. 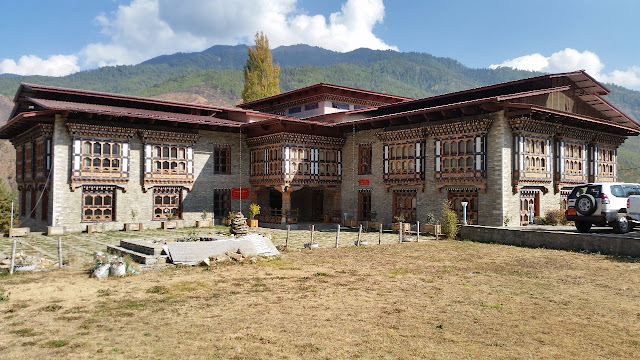 Chukha houses a hydroelectric power station which is one of the largest in Bhutan. By now there is a chill in the air. 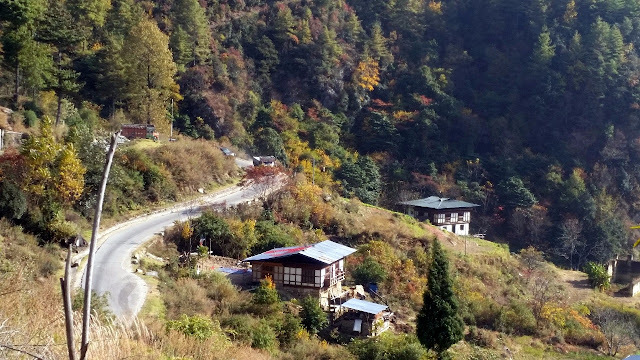 Our driver informs us that Thimpu is still two hours away, and it is better to have lunch at Chukha. 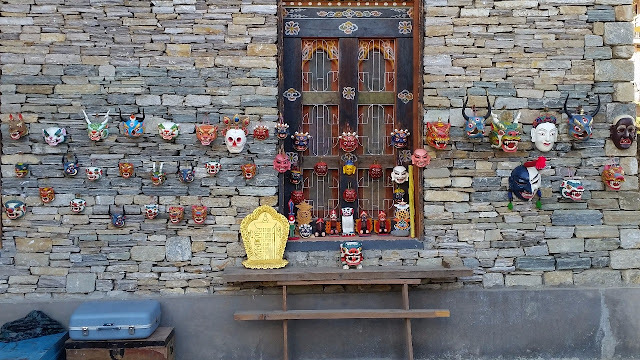 Dechen General Shop and Hotel is again a small place. 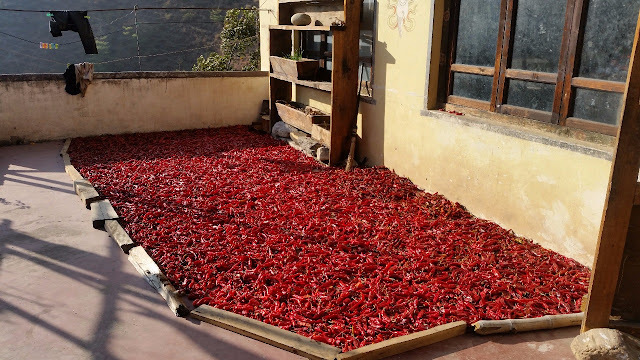 The huge amount red chillies put out to dry outside the restaurant gives us an idea of the spiciness of the food. Our lunch here is Norsha Ema Datshi and Phaksha Pa. 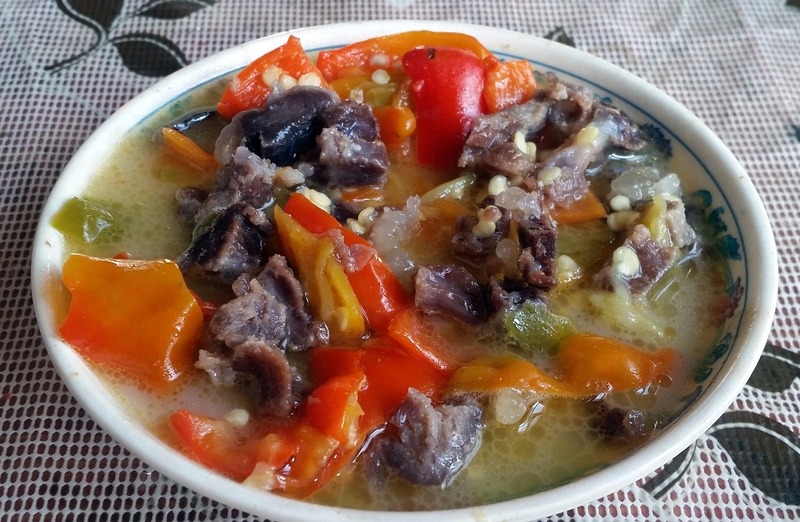 The former has beef added to Ema Datshi with the chillies tempered a bit. 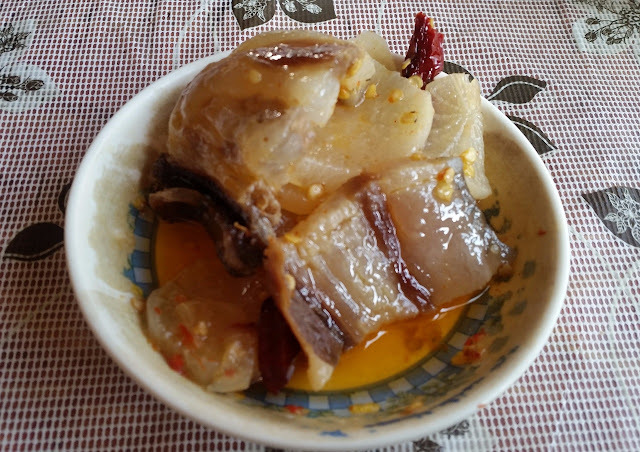 Phaksha is pork in Bhutanese. The dish, unfortunately, had too much of pork fat and hardly any meat. It is important to tell the waiter that you want meat in your pork dishes, as the Bhutanese prefer a lot of fat in this cold climate. And finally, there is the local Red Rice which is smaller in size than its white counterpart and extremely fragrant. We tried the rice with almost every Bhutanese meal and even brought some back with us to India. An hour after Chukha as you approach Thimpu, the mountains become quite barren, and the climb steeper. After a scenic drive for a couple of hours, we reached a huge gate welcoming us to Thimpu. It is close to 5 pm, and we promptly check in into Hotel White Tara, a new property in Olakha, a quieter part of the city. 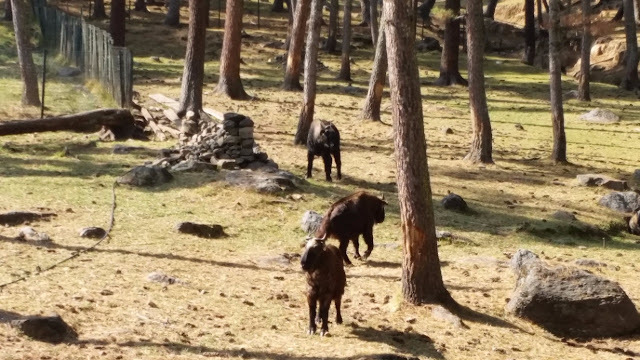 Our Thimpu sightseeing starts early the next day so we retire early. The next day is entirely spent on visiting various tourist spots in the city. 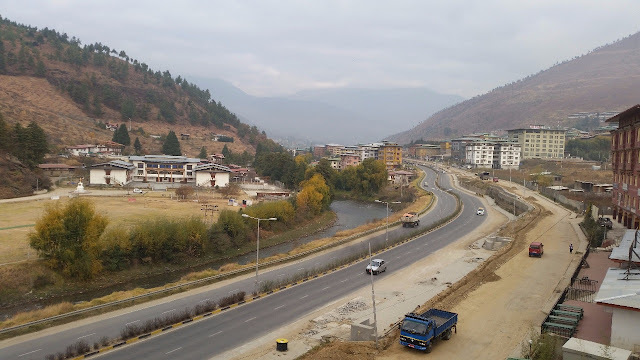 As we are planning to travel to Punakha the following day, we need inland permits for the same. Essentially, one needs to go to the immigration office is Thimpu and put a stamp on the permit obtained in Pheuntsholing. The whole activity takes more than one hour for us delaying the plan. 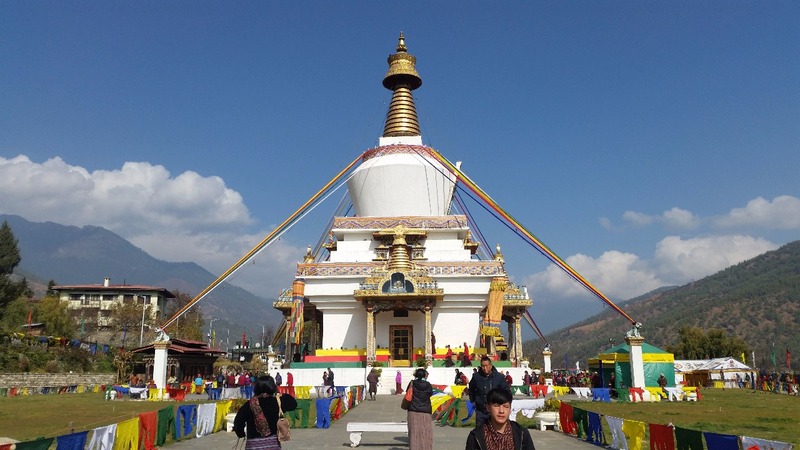 Our first sightseeing stop is National Memorial Chorten, a stupa dedicated to the 3rd King of Bhutan. While the stupa stands impressively the Nu 300 entry fee here irks me a bit. The sights inside do not justify the fees in my opinion. 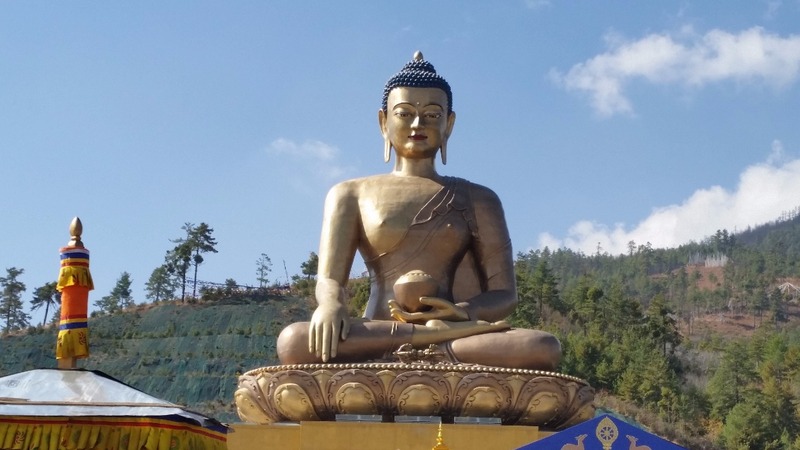 But the Buddha point on top of the city is a must visit as it provides a stunning view of Thimpu valley. 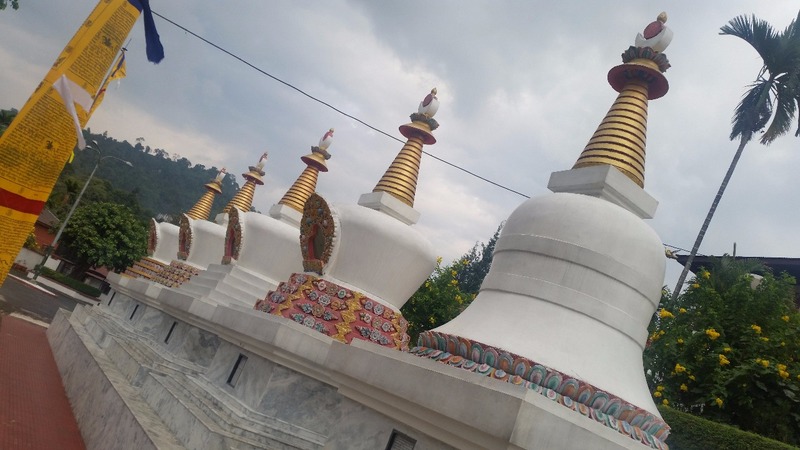 This is the highest point in Thimpu housing a huge 52 metres statue of Lord Buddha made of bronze and gold which is visible from areas away from the city too. Takin or a kind of mountain goat is the national animal of Bhutan and we have a look at it in Takin Zoo. 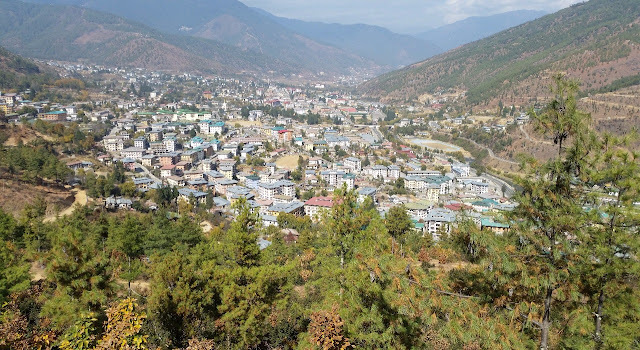 Above the zoo, the BBS (Bhutan Broadcasting Service) point provides another picturesque view of the valley. 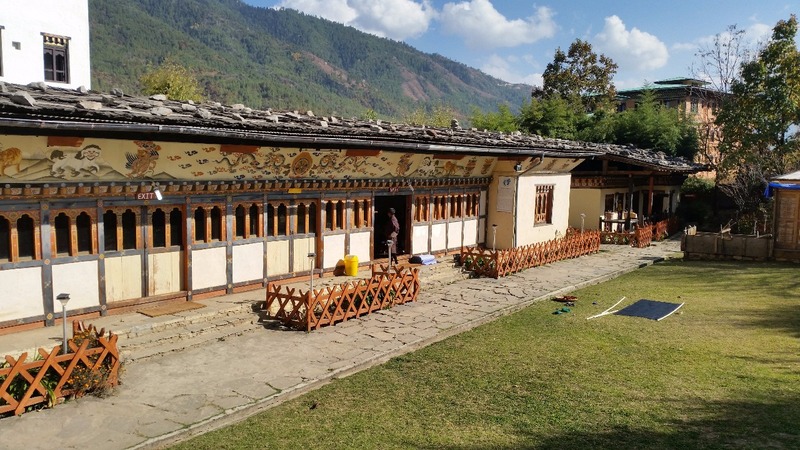 We also visit the Folk Heritage Museum, a place which has a replica of a century-old traditional Bhutanese building. It has a water mill, places for animal rearing and various apparatus used like rice pounders, and gives an idea of the Bhutanese rural lifestyle years ago. 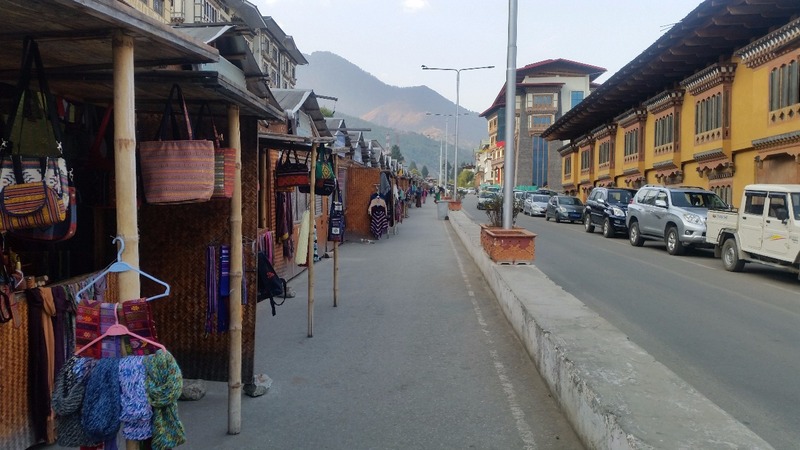 The restaurant here is quite famous for its Bhutanese fare, though our driver suggests a place close to the handicrafts market for an authentic Bhutanese meal. 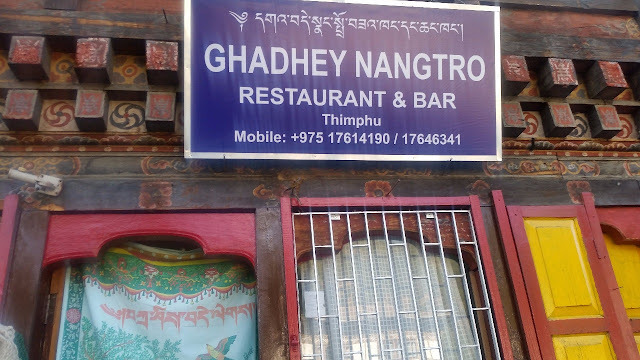 Ghadhey Nangtro restaurant and bar is almost a blink and miss place close to the handicrafts market. With a seating capacity of not more than ten people, it is almost a hole in the wall joint. But the meal we have here is possibly the best we had so far. 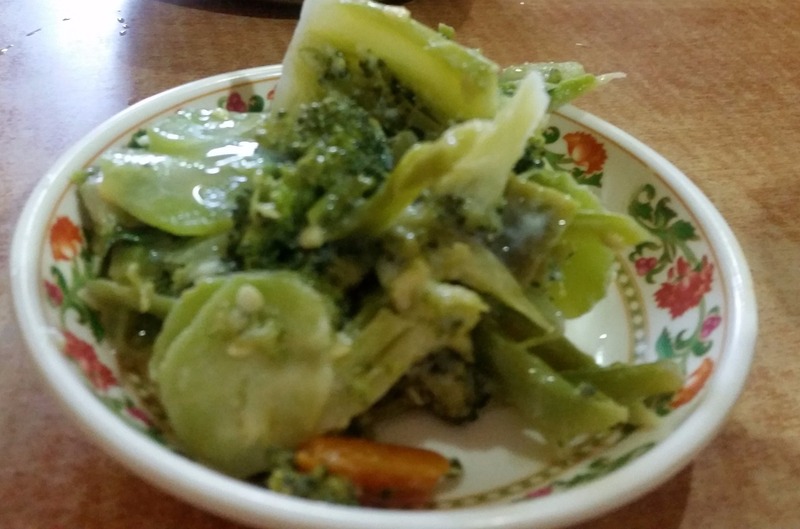 Here is the first time we come across Shamu Datshi, the mushroom-based variant of the popular cheese dish. The longer variety of mushroom used in the dish is soft and tasty, and the cheese soup here has the right density. They also have a broccoli-based datshi, a drier dish which turns out to be excellent. 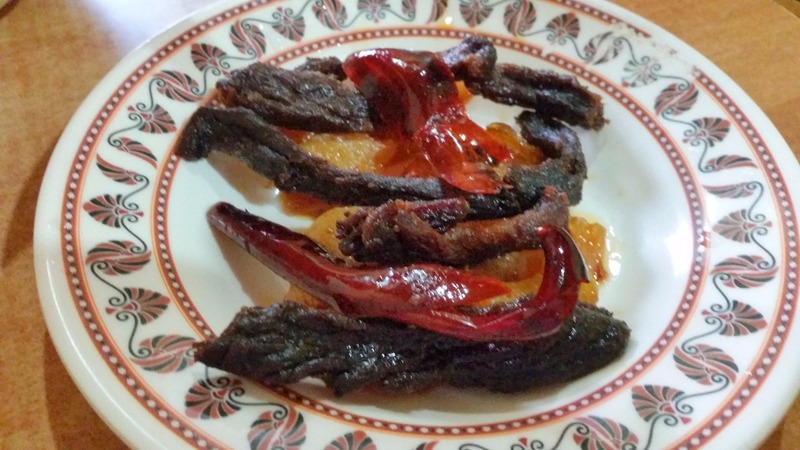 The Shakam Pa or dry beef preparation stands out mainly because of the taste the hard beef strips provided. 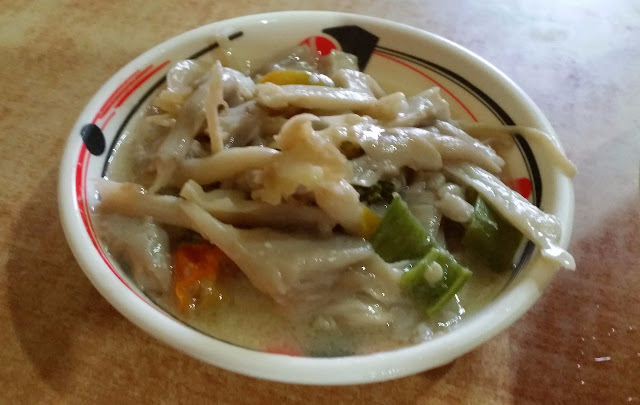 Jaju, a warm soup of milk and Ezey are also served with the food. 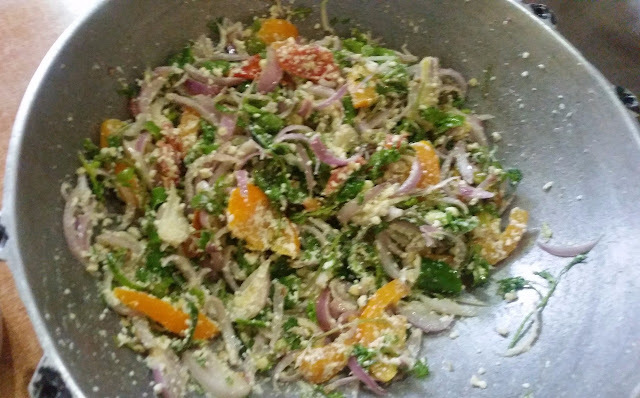 Hoggey Salad is another delicacy which we try here, which has sliced cucumber, green and red chillies, onions with crumbled datshi cheese. The entire meal for three of us costs only Nu 550. 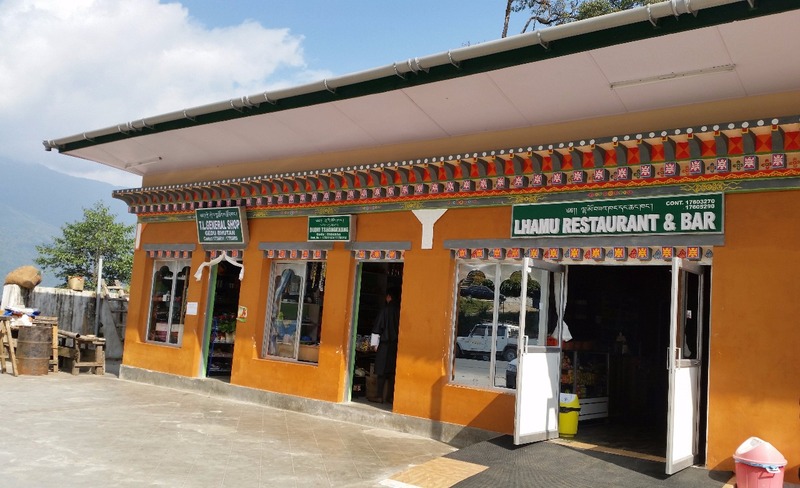 Small eateries in Bhutan are really economical. After a brief visit to National Library, we visit the Handicrafts market and Clock Tower. My wife picks up a Kira, the traditional dress of Bhutanese women. 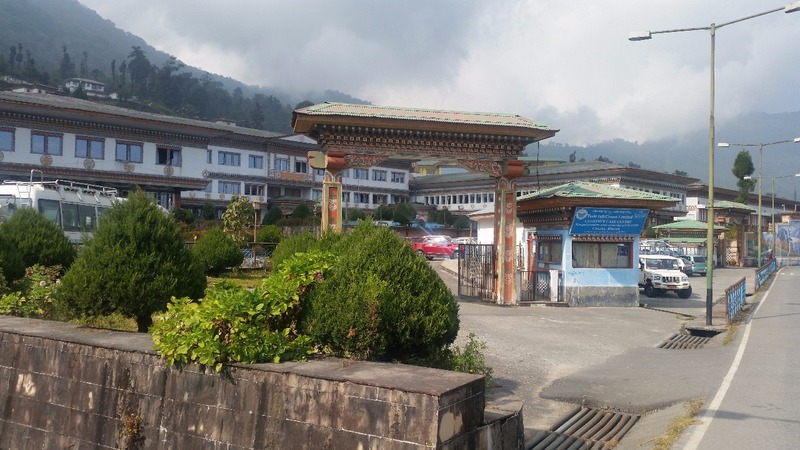 A nice one and half days at Thimpu comes to an end and we were looking forward to Punakha on the next day.